THE GRANARY is a pleasant, spacious first floor flat which used to be the barn attached to the original 17th Century farm cottage at West Pentire. 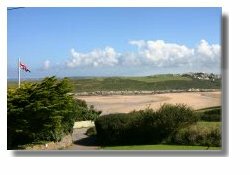 It is situated in a small hamlet towards the end of West Pentire headland and has wonderful views of the countryside and overlooking Crantock Bay. There is a small sheltered garden area adjoining the entrance drive, and a large car port underneath the accommodation. The front door opens on to a porch with stairs leading up to the flat, with a stair chair which can be used by elderly or disabled visitors by prior arrangement with the owners. The flat also has additional hand rails to help older visitors. 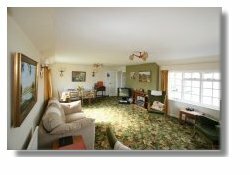 The fine large lounge/dining room has windows offering splendid views over the countryside and Crantock Beach. There is a colour TV and video and also a radio/tape/CD player. The hallway has a store cupboard and airing cupboard and leads to a fully tiled bathroom with toilet, handbasin, and power shower over the bath. The kitchen is fully fitted and has a fridge/freezer, electric cooker, microwave, washing machine and a dishwasher. There are two bedrooms, both with wash handbasins, one having twin beds and the other a double bed. A cot or small bed is available if required, on request. Bed linen and towels are provided but beach towels need to be brought by visitors. The oil central heating, water heating and the electricity are all included in the rental charge. Holiday Cottage Crantock. 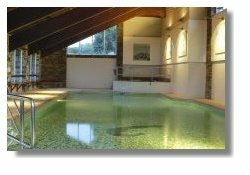 Granary visitors are welcome at the Crantock Bay Hotel - on the other side of the village green - and may use the beautiful indoor heated swimming pool and extensive leisure facilities at no extra charge. Visitors are also welcome in the restaurant and bar. West Pentire hamlet is exactly one mile from the village of Crantock, where one will find a general store and post office, and craft shops, as well as two pubs, an ancient and beautiful Anglican church, a Methodist chapel and thatched cottages. Dogs are allowed on local beaches and headlands provided they are under control whilst walking on farmland where there is livestock. They are also allowed in the Granary provided that they are kept off the furniture. Pentire hamlet is bordered on either side by the large sandy beach of Crantock Bay and the smaller beach of Polly Joke. Both beaches are ideal for safe bathing and exploring caves and rock pools. Our private garden with sheltered sunbathing areas lead directly on to the South West Coast Footpath and to the expanse of Crantock beach. With over a mile of golden sands, rock pools and caves to explore and the invigorating Atlantic Ocean, this really is a paradise for beach lovers and surfers alike. Most of the surrounding area is National Trust land and is well known for its wide diversity of flora and fauna. Part of the headland is designated an Area of Special Scientific Interest. The South West Coastal Footpath runs right round the headland and everywhere there are wonderful walks with magnificent views. This is a truly wonderful setting in which to relax - and many of our guests do - from morning to night. On your doorstep but with the Lost Gardens of Heligan a Eden Project, Cornish beaches and shopping in Truro are all within 20 minutes drive. Even Lands End is only an hours journey away. Places to see- so much for everyone to enjoy.... Lands End (43 miles), Camel Trail, Eden Project (17 miles), National Maritime Museum, Wheal Coates (17 miles) Tate Gallery (31 miles), Lost Gardens of Heligan , St Micheals Mount (32 miles). So much for everyone to enjoy. Just a few of the many fascinating and beautiful places within easy reach of Crantock Bay. Page created 17th Jan. 2010.